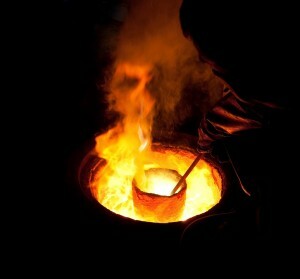 The West African nation Ghana is known as one of the top gold-producing countries in the world. From the most recent data, it ranks as #10 on the planet, and is second in the continent of Africa behind only South Africa. On an annual basis, the national gold output of Ghana is consistently above 90 metric tonnes. Now, thanks to the Egyptian company Euroget group, Ghana will also boast the continent's second-largest gold refinery (behind the South African Rand Refinery). According to the Egyptian Ministry of Foreign Affairs, the new plant will refine raw gold dust, scrap gold, as well as other precious metals. Its refining capacity will be of extremely high quality: It will produce "five-nines" gold, meaning .99999 fine—99.999% pure. To date, the Royal Canadian Mint, the Perth Mint, and world-class Swiss refiners have been among the only operations to achieve this feat. In addition, the facility will offer storage and export of gold, jewelry manufacturing, and a showroom. Its estimated cost was $110 million. Ghana's president, John Dramani Mahama, was in attendance for the refinery's official inauguration ceremony on Friday. He was joined by a number of the country's legislators and government ministers. The plant will go into full operation in December. Beyond helping Ghana move toward its goal of becoming the African continent's gold jewelry hub, the new state-of-the-art refinery also strengthens the existing bonds between Egypt and Ghana.